Product Details: Plant-Based/ Ingredients to Support Energy and Focus. Rhodiola. B12 Electrolytes. 100mg Caffeine. 16g Carbs. Eleuthero. Great New Taste. Made With Real Plant-Based Food Ingredients. Get In The Zone With Energy To Burn. 100mg of Caffeine from Coffeeberry and Green Tea to Help You Focus. Premium Carbs To Help You Push Hard. Rhodiola and Eleuthero. Electorlytes. 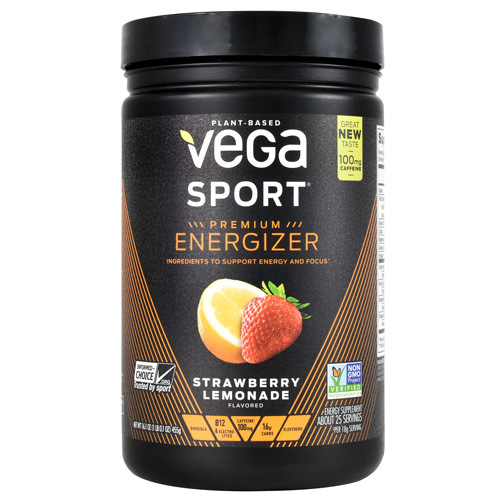 Vega Sport Nutrition System: Fuel Your Better with Vega's Three Stage Performance Nutrition System-Pre, Mid, and Post Workout. Vegan. Gluten Free. Other Ingredients: Organic Coconut Palm Sugar, Brown Rice Syrup Solids, Natural Flavors, Malic Acid, Citric Acid, Organic Beet Root Powder (For Color), Lemon Extract, Stevia Leaf Extract, Calcium Chloride, Potassium Chloride. Directions: Shake It! Mix One Level Scoop of Vega Sport Energizer in 1-2 Cups (8-16 Fl Oz) Of Ice Cold Water. Warnings: Contains: Coconut. Manufactured In A Facility That Also Processes Peanuts, Dairy, Soy, Egg, And Tree Nuts. Do Not Use If Seal Is Broken Or If You Are Sensitive To Caffeine. Not Recommended For Children, Or Pregnant Or Nursing Women. After Opening, Close Lid Tightly and Store In A Cool, Dry Place Away From Direct Light. Product Contains Silica Packet To Maintain Product Freshness. Do Not Consume.